On which sections do I have to pay route toll? Which tickets are available and am I entitled to a discount? Here you can find the answers to these and other frequently asked questions about route and video toll. Where do I find an outlet that sells the digital section toll? An interactive search for sales outlets near you, you can find in the menu Sales outlets. Innsbruck Information u. Reservierung G.m.b.H. For more information, please call the ASFINAG Service Center on 0800 400 12 400 (free from Austria, Germany) or +43 1 955 12 66 (charge applies from all other countries). Can I buy a route toll ticket before I set off? With the video toll system you can buy route toll cards before you start your journey. When you buy the ticket or card, your number plate is registered and activated. As soon as you enter the toll lane of your choice with the registered vehicle, the car number plate is identified, the barriers open and you can pass through quickly without having to stop. Tip! If you buy your annual pass as a video ticket or at the toll station, you are protected against loss. Your vehicle number plate is registered in the system for the duration of the validity period. Where can I pay for the route toll? Directly at the toll station by cash, credit card (VISA, Diners Club, Mastercard and American Express), fuel card (DKV, Esso, Shell, OMV, Routex, UTA) or Maestro card. 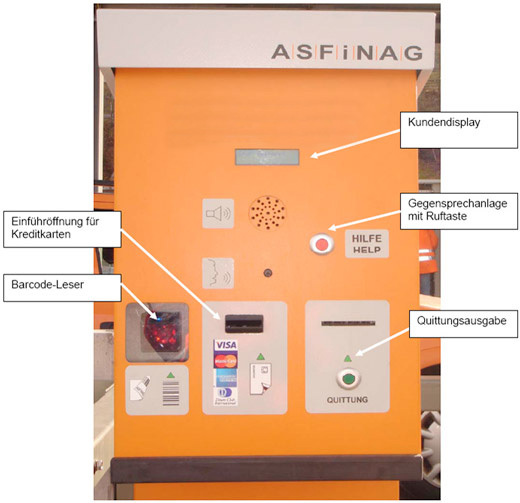 There are also toll processing machines at the toll stations, which again accept cash, credit card (VISA, Diners Club, Mastercard and American Express), fuel card (DKV, Esso, Shell, OMV, Routex, UTA) or debit card (Austrian Maestro card and German EC card) The machine accepts coins and notes (up to 20-euro note), and it gives change. There is a button you can press if you would like a receipt. Tip! Paying using the toll processing machine: Take your receipt! The toll covers your onward journey on the A 13 within 24 hours in the same direction. 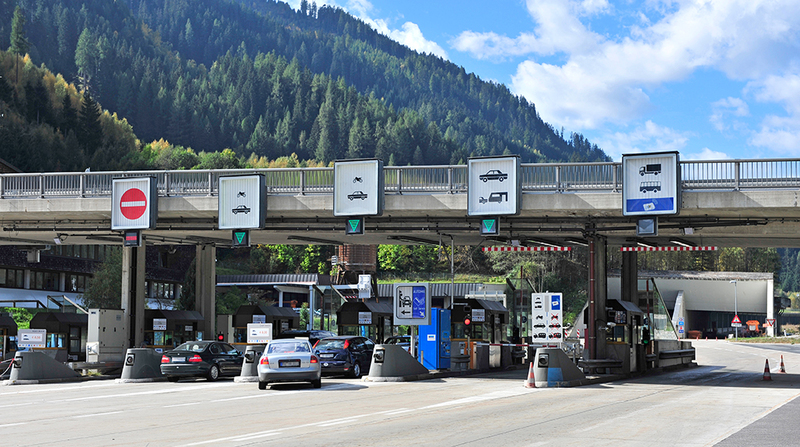 In addition to the above toll machines, there are credit card machines on the A 13 Brenner motorway, the A 10 Tauern motorway and the A 9 Pyhrn motorway. These differ from the toll machines in that they do not accept cash. The lanes that take you to the credit card machine are marked in bright orange. At toll stations you are always on the left in the direction of travel. 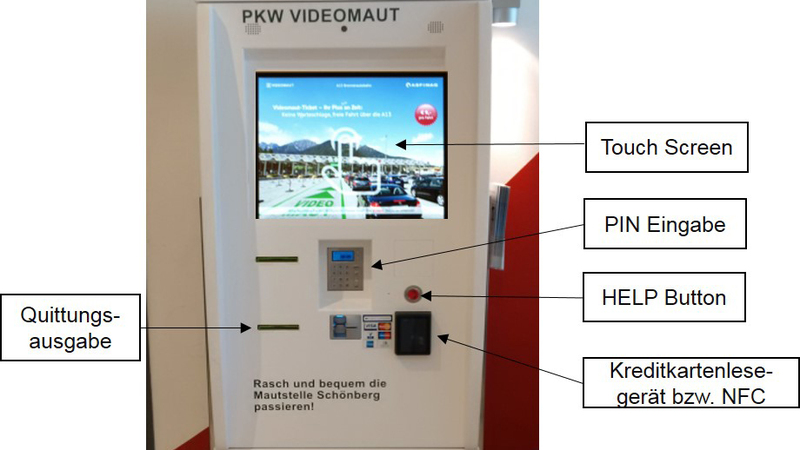 At the OMV petrol station Brenner and Rest area Münster Nord you can buy a video toll ticket from a machine. The machines only accept credit and debit cards, not cash. In addition to buying a ticket, the start screen also gives you the option to press the "watch traffic" button, which allows you to view the traffic situation. Depending on the location of the machine, the current traffic situation around the relevant toll station will be displayed. The easiest way to obtain a route toll ticket is via the video toll system of ASFINAG. A video toll ticket can be purchased in minutes from our website or from our free ASFINAG app "On the road" and from other sales partners (such as ARBÖ and ÖAMTC). What is the digitale section toll? Digitale section toll refers to the automatic processing of your car at the route toll station. When you buy the ticket/card, your number plate is registered and activated. As soon you you enter a toll lane of your choice with the registered vehicle, the car number plate is identified, the barriers open automatically and you can pass through quickly without having to stop. The big advantage: The video system works at all open toll lanes, and you can choose any lane you like. A video toll ticket can be purchased in minutes from our website or from our free ASFINAG app "On the road" and from other sales outlets (such as ARBÖ and ÖAMTC). The digital section toll ticket works on all open car toll and credit card lanes. When you purchase the digital section toll ticket online it also stays valid until you first use it, but for no longer than one year. No annual toll card can be issued for trial run number plates (Probekennzeichen) and transfer number plates (Überstellkennzeichen). 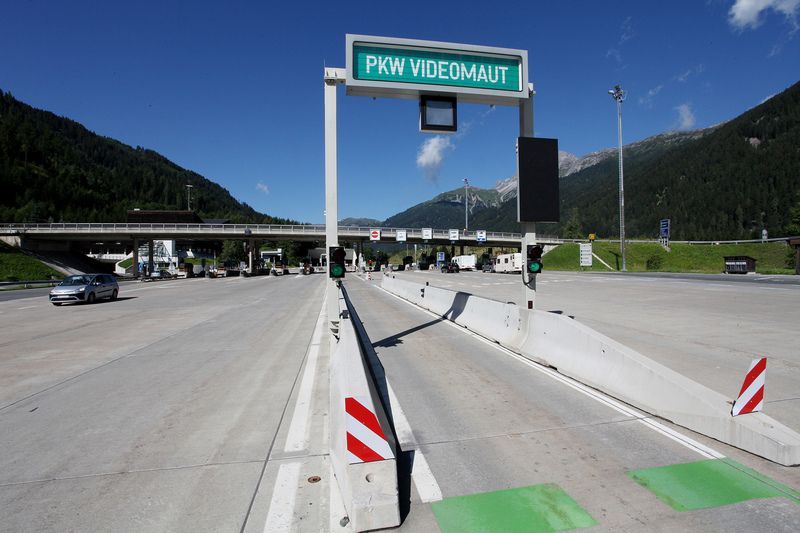 The specially marked video toll lane can only be used by cars without a trailer. The car must be no wider than two metres (wheelbase). GO lanes are reserved for our GO toll customers (lorries and buses of more than 3.5 t mpw), and you cannot use them even if you have a digital section toll ticket. The GO lane at the toll station – what is that? There are GO lanes at all ASFINAG route toll stations, which are exclusively designated for motor vehicles of more than 3.5 tons maximum permissible weight (mpw) (lorries, buses, heavy camper vans). The GO lanes are always on the far right in the direction of travel and are marked as such. The GO lane may not be used with vehicles weighing less than 3.5t mpw (cars, motorbikes, light camper vans); instances of non-compliance will be prosecuted. The GO lanes may not be used by holders of annual toll cards and video toll cards either! Reserved for lorries: The GO lane - on the very right - at the toll station. How do you buy a digital section toll ticket using a smartphone? 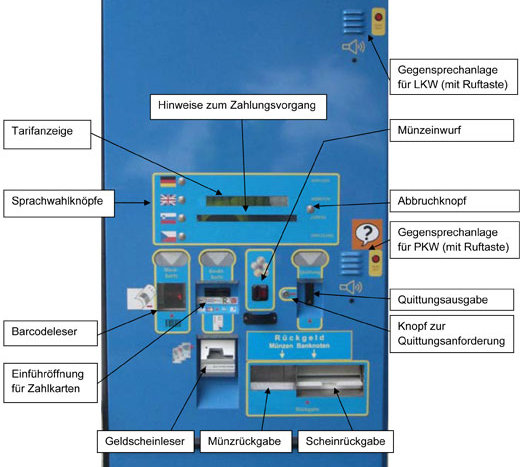 The free ASFINAG app Unterwegs is available from the Play Store and from the iOS App Store. Simply download the app to your smartphone. Under the menu item "Shop" you can pay for single trips or an annual pass for the section toll of your choice. How do you buy a digital section toll ticket online? When you buy online in our webshop, you can choose between a single trip and an annual pass. You can conveniently pay by credit card (VISA, Mastercard, American Express, Diners Club), PayPal or Instant Transfer (Klarna Sofort). This offer is aimed at drivers of Austrian and foreign cars. The annual pass is linked to the number plate and is valid for one year from the date of issue. Tip! Once you have bought the digital section toll ticket online, print out the receipt you see on the screen. If you provide an email address you will also receive a confirmation of purchase. Holders of annual passes can be issued a toll card in the shape of a bank card at the toll station. I have a valid yearly toll sticker. Does this give me discounted route toll tickets? If you hold a valid yearly toll sticker and produce the lower section of the toll sticker (= carrier foil) you will get a one-time discount of 40 euros on the price of the annual toll card. Which tickets are available for route toll sections? The single ticket is valid for one trip (for all vehicles up to 3.5t mpw). There is no discount for return journeys. The annual pass is tied to a specific number plate and route and is valid for one year from the date of issue. No annual pass is issued for vehicles with trial run number plates (Probekennzeichen) and transfer number plates (Überstellkennzeichen). Please note! The Arlberg Tunnel is closed from 24 April to 2 October 2017. The period of validity of your annual toll card for "S 16 Arlberg Tunnel" will automatically be extended by the length of time the tunnel is closed. For more information on total closures and the period of validity of your annual passes, please call our service hotline on 0800 400 12 400. This pass is linked to the number plate of your vehicle. For the duration of 30 calendar days it entitles you to unrestricted use of the A 13 Brenner motorway. This pass is issued on presentation of the registration certificate at the toll station. Residents of the Wipp and Stubai valleys are issued what is called a resident pass on presentation of certain documents. This pass is valid for one year from the date of issue. Tip! The resident pass costs 40.50 euros (01/01/2017). On presentation of the carrier foil of the yearly toll sticker at the toll station, the customer receives the annual pass free of charge. The A 13 resident pass cannot be bought online because the required documents cannot be checked. The card is valid for 14 trips through the Karawanken Tunnel within 30 calendar days of issue. Unused trips expire after 30 calendar days. This card is tied to a specific number plate. A video toll ticket can be purchased within minutes here online, with your smartphone using the free ASFINAG app "On the road" and from other sales outlets (such as ARBÖ and ÖAMTC). The fastest way to work takes me via a route toll section. Do I get a discount? We offer a special discounted annual pass for commuters. It is a season ticket that is tied to a specific number plate. The validity of the commuter pass depends on the duration of employment and is limited to one year from the date of issue. For the toll routes of the A 9 Bosruck/Gleinalm, the entitlement is checked separately for each section. This annual pass is issued at your toll station. Tip! You are a commuter, you meet the eligibility requirements for a commuter pass (see above) and you have a valid yearly toll sticker? Then the annual ticket for your route toll section is free. Please present the valid carrier foil of your toll sticker at your toll station. For the toll routes of the A 9 Bosruck/Gleinalm, the entitlement is checked separately for each section. In accordance with the restriction notice in my driving licence, I am a person with a disability. Am I entitled to a discounted route toll ticket? Generally, no discount is given on single trips on route toll sections. However, people with a disability are entitled to a discounted annual pass in accordance with § 29b StVO (Road Traffic Act) with a restriction notice in the driving licence (e.g. brake on the steering wheel, automatic vehicle). Such a pass is issued only for a vehicle registered to the disabled driver and may only be used if the registered vehicle is in fact driven by the disabled person. 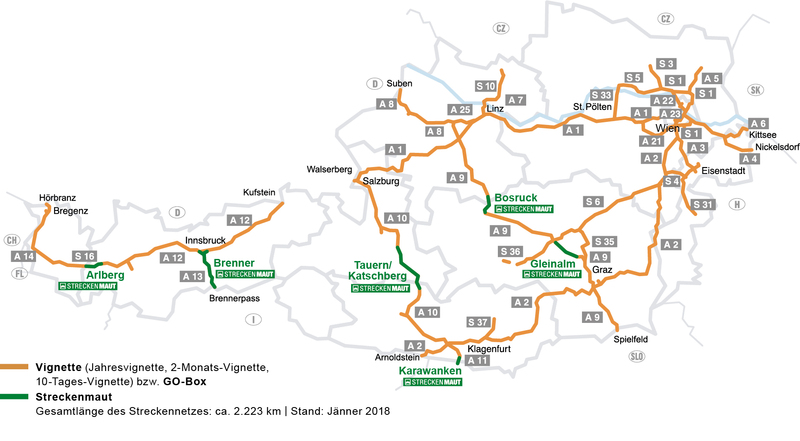 The pass is valid for one year from the date of issue and it covers all Austrian toll route sections except the A 11 Karawanken motorway. It costs seven euros and is issued at your toll station. I am doing military service/ civilian service and I commute daily along a route toll section. Am I entitled to a discounted annual ticket? The pass is valid for the confirmed duration of the military/civilian service only. Tip! You are doing alternative civilian service, you meet the eligibility requirements for a commuter pass (see above) and you have a valid yearly toll sticker? Then the annual ticket for your special toll route is free. Please present the valid carrier foil of your toll sticker at your toll station. For the toll routes of the A 9 Bosruck/Gleinalm, the entitlement is checked separately for each section. I have problems making a payment using the toll processing machine / credit card machine. What do I do? Please contact a staff member at the toll station by pressing the help button on the machine. I have a valid digital section toll pass/ticket, but the barriers won't open. If your number plate is not recognised automatically (for example because it is very dirty), hold your annual pass or the digital section toll ticket / video toll card ready. Your vehicle will be redirected to another open toll lane. Now please hold the ticket with the barcode to the scanner of the toll machine and follow the instructions on the screen. Alternatively, you can give the receipt code to the toll staff member or show the receipt stored on the "On the road" smartphone app to the staff member. If the video toll ticket or the receipt cannot be shown, you will have to pay for the single trip; we thank you for your understanding. I have bought a new vehicle / I have moved and I would like to transfer my route toll annual pass to a new car number plate. Is that possible? Yes. During the validity period, the annual route toll can be transferred once to another license plate under the following conditions and with the necessary documents. However, the general requirement for a transfer is that the license holder does not change. The processing fee is Euro 18, -. In the case of district consolidation, loss, theft and total damage, the processing fee of Euro 18, - will be refunded. Is my annual pass/digital section toll card still valid? You can check the validity of your annual pass here. I have lost the annual pass for my route toll section. What do I do? A lost annual pass can be re-issued. Please speak to your toll station and bring your registration certificate with you. You will be charged a processing fee of 7 euros for the new pass. Tip! If you buy your annual pass as a digital section ticket, you are protected against loss. Your vehicle number plate is registered in the system for the duration of the validity period. I pass a route toll section with a trailer/camper van. Can I use the digital section toll card? All vehicles up to a maximum permissible weight of 3.5 tons can purchase a video toll ticket (single trips and annual toll card). 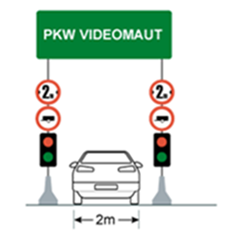 The designated video toll lane (on the very left) is only for vehicles without a trailer, with a width of less than 2 m and a height of less than 4.20 m. What counts is the track or body width without the wing mirror. All toll lanes except for the GO box lane are fitted with cameras. Every lane can therefore be used with the video toll ticket.